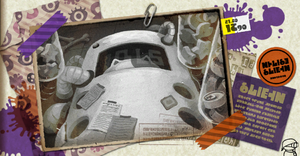 Unavoidable Flying Object is the twenty-seventh mission in Splatoon's single-player mode, Octo Valley. 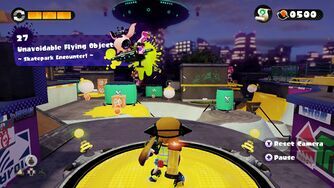 It takes place in a modified version of multiplayer stage Blackbelly Skatepark and is the last non-boss mission. Take the small ramp on the left and furthest from the entrance of Area 5. There is another ramp, use the ramp and the Inkrail on above the ramp. Go up the grate path, then go to the next Cube platform, expand 2 Sponges. Then there is a platform with 2 Inkrails, use the Right-Side Inkrail, it'll take Agent 3 to mission 27. The only key that can be found within this level is located on the central tower of the level. Location: Along the western wall of the map on top of a wall. This scroll will be easily seen if you go to the central pillar of the map and take a left. However, the scroll cannot be reached this way. Go to the northern end of the map and take a u-turn around the left wall. There should be an Octosniper waiting for you. Splat the Octosniper, climb the various slopes, and shoot the crate sitting atop the wall to find the scroll. Location of Armor 1:After letting the first Ink Balloon explode, One Crate will reveal a piece of armor. Location of Armor 2: After Reaching the Checkpoint on the center of the map, thereis a crate standing on a grate, it holds armor. As seen from the UFO at the end of Unavoidable Flying Object, there are basketball courts near Blackbelly Skatepark. Like all UFO-based stages, the Italian name for Unavoidable Flying Object references a science fiction movie. In this case, it may be Aliens, called Aliens - Scontro finale in Italian. The Mortal Combat at Blackbelly Skatepark! final battle with the UFO!